Heat Pump Water Heaters Are for Cold Climates, Too! Home » Heat Pump Water Heaters Are for Cold Climates, Too! I left Berkeley for Truckee, a small town near Lake Tahoe, on a mission to raise my kids in the mountains and help create high performance buildings in a cold climate. 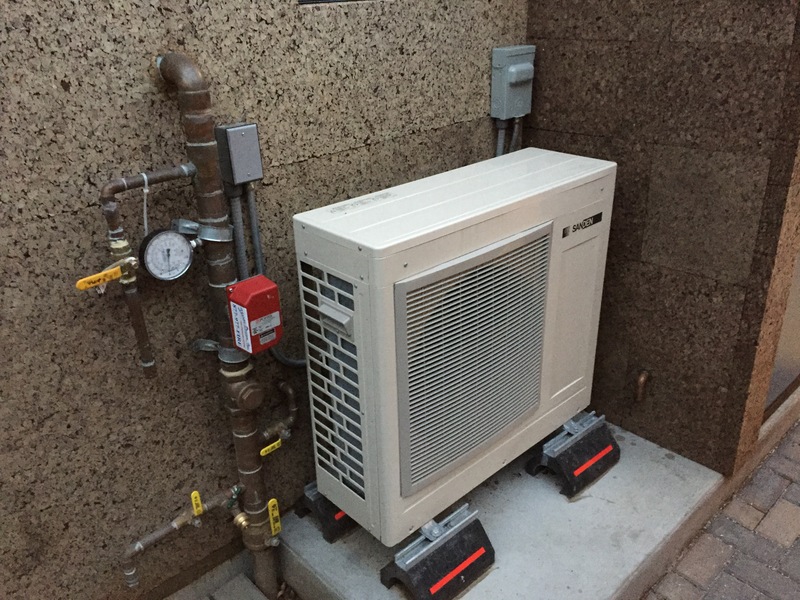 While living and practicing in the San Francisco Bay Area over the past decade, the case for weaning existing buildings off natural gas or propane through electric heat pump water heater (HPWH) conversions—or engineering new all-electric buildings with HPWH and eliminating the infrastructure for natural gas or propane all together—has become increasingly compelling. Different climate = different solution, or not? While I moved from a temperate climate zone (CZ 3 based on California’s sixteen climate zones as defined by Title 24) to a cold mountain climate zone (CZ 16) with an open mind to new approaches, I’m finding that HPWH technology can be designed to work in Tahoe too. Replacing an aging gas water heater with a HPWH, or specifiying a HPWH for new buildings, is a feasible way to join the renewable energy future. And with some utilities such as Truckee Donner offering rebates as much as $3000 dollars for a conversion, it can be free from additional upfront costs. The Sanden SANCO2 is one of many HPWH products on the market; other manufacturers include Rheem, A.O. Smith, Bradford White, Stiebel Eltron and others. Considerations for selecting a HPWH appliance include rated efficiency or coefficient of performance (COP), performance at various outdoor temperatures within the target climate, hot water recovery rate, power supply requirements (e.g. 30A or 15A), equipment location and space requirements, and other aspects. You can learn more about HPWH technology and product options here. Water heaters consume more energy than all other household appliances combined, using 17% of total household energy in detached single-family homes and a whopping 32% in apartments or condos according to U.S. EIA. Converting aging, inefficient gas heaters with a modern HPWH can make a significant dent in energy use while providing the satisfaction of joining the decarbonization movement. Wherever your building resides, we’d love to support your electrification and zero energy efforts. Get in touch to tell us about your goals and learn how we can help!